Dec 13 This post is part of the 2009 performance advent calendar experiment. Stay tuned for the articles to come. While these have some grain of truth to them, they are mostly misconceptions. Before addressing them, one quick background point - what's PNG8 and why it's cool. 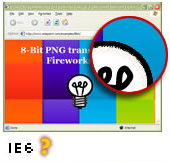 PNG8 is like a GIF - it has a palette of 256 colors and supports transparency. While GIF supports true/false transparency (a pixel is either transparent or it isn't), PNG8 supports variable alpha transparency. Right there you see - PNG8 can do anything that GIF can, plus more. 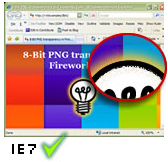 There's a little glitch in IE6 where a semi-transparent pixels in PNG8 are seen as fully transparent, just like a GIF. So here's an option for progressive enhancement - you use the same image and IE6 gets a degraded GIF-like experience, while modern browsers get the full experience. Another pain point is that Photoshop doesn't produce semi-transparent PNG8 (although they came up with the name "png8" instead of saying palette or indexed PNG). Only Fireworks does export alpha transparent PNG8, which makes it a bit of a challenge. You also need a good designer to undertake this tricky task of making sure the image looks OK in both experiences. One way is to assume you're working with a GIF and then upgrade the experience with the carefully selected semi-transparent pixels. It could also help you keep the gif-like version in a layer and use other layers for the semi-transparent stuff, so you can quickly preview what the image will look like in IE6. In any event - the important thing to remember is that in the worst case (IE6) PNG8 is as good as a GIF. PNG doesn't work in browsers? If you end up using AlphaImageLoader, make sure you use the underscore hack so that only IE6 users experience the performance degradation. PNGs are bigger than GIFs? Again - PNG8 is the file format comparable to GIF and it's almost always smaller in filesize than GIF. Using Yahoo! image search web service I downloaded some GIFs (matching the queries "logo", "mail" and "graph"), ended up a little over 1700 images. Then I used optipng to convert them all to PNG and see the results. Interestingly enough 4% of the images were smaller as GIFs - utter disappointment (and don't tell anyone!). So I had to try just a little harder. I didn't run OptiPNG with its best -o7 option, but ran PNGOut instead. The results is that now only 4 of the 1706 images were smaller as GIF. I'm pretty sure that trying a little harder (with PNGSlim, see yesterday's post) would've probably fixed it, but 4 out of 1700 is something I could live with. BTW, the images where OptiPNG failed to produce smaller PNG, then PNGOut converted with the ratio of 21% median savings. Not bad for taming the few shrew GIFs. BTW, some GIFs lost over 100K of filesize, the max was over almost 600K savings! So, you never know. If you like to look at numbers, here's a csv dump - the optipng results and the selected few that ran through PNGout. So, take-home message: turn your GIFs into PNGs and win at minimum 20% fewer bytes over the network. pngoptimizercl -cp before.png after.png; pngoptimizercl -file:"after.png"
"Success rate" is how often the tool managed to produce a smaller result than the original. For example PNGRewrite's success rate is pretty low, because it only works with up to 256 colors. Median time to run is the median value that the tool takes to optimize one image. My secret goal was that everybody who hears the song or watches the video, will think twice the next time when doing "Save for the Web..." in Photoshop. Music: Drums from GarageBand, I play two guitars, also bass (a guitar with effect actually) and vocals. If you think you hear a woman's voice, it's still me, with "Helium" effect. The MP3 is here. If you want to experiment with the song yourself, here's a zip with each channel as an MP3. The http://givepngachance.com URL is currently pretty blank, but I intend to add more PNG-related stuff there. Oh, and the lyrics.